Nations Press feature news JUST IN:"Miracle Water" From Cebu City Chapel Positive From E. Coli-Must Watch!! JUST IN:"Miracle Water" From Cebu City Chapel Positive From E. Coli-Must Watch!! 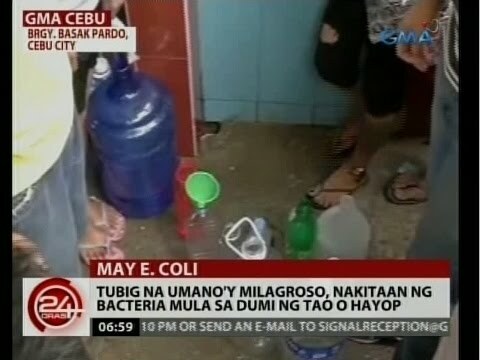 SPONSORED LINKS Local health officials urged people flocking to a church in Cebu City to stop drinking "miracle water" there since it contains bacteria that can cause diarrhea and other water-borne diseases. Results of the water potability test showed the water from San Roque Chapel in Barangay Basak Pardo was contaminated with E. coli bacteria, which is found in human and animal waste, according to Dr. Alice Marie Arcaydo of the Cebu City Health Department. The Metro Cebu Water District said the source of the water could have been a leaking underground pipe. As a precautionary measure, Basak Pardo Barangay Chairman Yolandito Cagang said they will soon prevent people from fetching water from the pipe. Residents, however, stood by their belief that the water was miraculous. Nine-year-old Errol Bermiyo, who is suffering from a heart disease, claimed he got better after he drank water from the chapel. "OK na," Bermiyo said in a report on Tuesday. "Hindi marumi 'yan, lalo na kapag milagro 'yan ng Sto.Niño," a woman said. According to GMA News they still getting the church's side as of posting time .